1,000 Strong, And Growing – A Wild Fermentation Giveaway! You know that jingle for kid’s vitamins: We are Flintstones kids – ten million strong, and growing…. Please tell me you remember that ad or I’m going to feel really, really old. Anyway, that tune has been running through my head about the Northwest Edible Life Facebook page, except instead of ten million, it’s a thousand strong (1,022 at last count). I gotta say, I’m pretty excited about hitting a thousand Facebook fans (“Likers”?). And when I’m excited, I buy books. For you. So, here’s the deal: I’m giving away one copy of the bible of preservation-through-microbial-action, Wild Fermentation by Sandor Katz. This is pickle making time, people. It’s time for sauerkraut and kimchi and sourdough and all kinds of other stuff that gets pretty tasty thanks to Lactobacillus and countless other of her fellow friends, the beneficial bacteria. It’s Beer-Thirty and a Quarter Past Wine, and those need little beastie helpers, too. 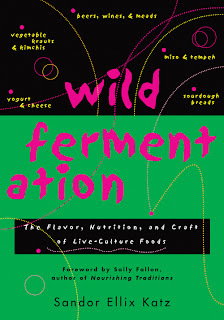 Wild Fermentation goes into all these things and more, and teaches you how to safely and confidently perserve and enhance the flavor of your foods through fermentation. I love this book. I follow Sandor’s recipes for a basic lacto-fermentation brine and have never lost a batch of pickles or beans or turnips. And it’s such and easy preservation technique…way simpler than canning! Step 1 – “Like” the Facebook page and leave a comment here on the blog letting me know you’ve done so. If you already Like NWEdible, just tell me that. If you have a conscientious objection to Facebook, let me know what it is and we’ll call that good enough. I’m self-sponsoring this one, so the rules are pretty relaxed. Step 2 – In the same comment, tell me what your experience is with preserving through fermentation and why you want this book. You don’t have to write a thesis – I’m not going to judge your responses or anything, I’m just curious and hoping you’ll share. So, one comment and you’re entered. The winner will be drawn randomly and announced next Tuesday, August 30th. In the meantime, I recommend Sandor’s extensive and useful website for more information on wild ferments. My sincere and tremendous thanks to all 1,022 of you who’ve been willing to join me on this gardener-foodie-urban-homesteader-mom-life ride. It’s pretty amazing to be a thousand strong, and – hey, look! – we’re all growing. Thank you. I've only made a fermented blood orange marmalade with whey. I would LOVE to get this book and learn more! I check the book out once in a while from the library, but it would be great to have my own copy! I like doing cabbage, cukes, jalopenos, garlic, all kinds of stuff! Just found the page from Punk Domestics. Having moved to the 'country' within the last year, this city girl has found herself with a surprising passion for all things canning, pickling, and fermenting:) From jams and jellies, anything pickled, to brews, it's all good. Ok, I just "liked" you, now I need to read your blog 🙂 My experience? I do cheese. I did my first fermented pickles and sauerkraut last year, the kraut was awesome, the pickles were not, and this year we are doing beer. I love me some fermenty stuff. I want the book because I checked it out once from the library and I want to be able to reread it any time I want. And inflict it upon my friends. So far we have only fermented some wonderful adult beverages. Now that we have a growing veggie garden it is time to learn more! Wow, over 1,000 Likes?! Dang Girl! I only have 3, and one of them is me! I joined the other "likers" and I have to be honest, I have never fermented anything, but I sure would love to try! What a great giveaway! Thanks for entering mine as well! I've 'liked' your page for a good long while now… and this book is for me. I brew beer and mead… and am also getting into other ferments for healthy eating and winter storage. My family is trying to gather, grow, hunt and forage as much of our food as possible on our urban farm.. check out my page if you get a chance @ https://www.facebook.com/pages/Radicle-Routes-Permaculture/229865793695428 and see what we are up to!! Cheers to you and other people on the same wavelength as us!! Blessings and good harvest to you all!! I don't have any experience so far with lacto-fermentation. I drink only raw milk and yesterday while at the store I saw a bag of organic dried whey. I stopped briefly and thought, "Hmmm, I think I remember seeing some things that use whey." So I came home and today I saw a recipe using raw milk, extracting the whey and using it to lacto-ferment fresh salsa. And with the left over sour milk, you can get sour cream and cream cheese. Awesome. I am totally wanting to try this. Well, my chances of winning are slim to none seeing all these comments. I don't "go out there" with FB, so here it is. My chance. I will probably buy the book, as I would love to learn how to use this process. Closest I come is making wine. I read your great blog regularly! A friend of mine has the book, and I've borrowed it to make dandylion beer, and now have made several more batches of beer with different ingredients, I make goats milk yogurt weekly, I have an ongoing batch of kombucha, but there is so much more I need to learn, I definitely need a copy of my own, so if I don't win, I'll just have to buy a copy! thanks and keep up the great work! FB makes me a little crazy, but I had to give in and go with it… to keep up with my brother… who is a photographer… and posts family and vacation pictures there. So I putz along with it, and have actually appreciated it lately due to getting updates on our adopted baby brother who is back in the states recovering from gunshot injuries while in Afghanistan. So FB can even be a blessing. I'm 57 and have made three batches of crockpot yogurt recently. That's it. Late bloomer. But, I have the stuff to make my first sauerkraut and will get it going this week. I'm just learning from blogs, which seems better than most cookbooks I own. Bloggers include lots of pictures and lots of notes that cover all the little problems one runs into. Pretty cool, huh? Have been enjoying your blog for several months now. Confession: last year was the first time I ever visited a blog. Again, late bloomer. Thanks for sharing so much cool stuff from your world. I liked you on FB, would love to win a copy of this fabulous book! Anxious to try some other ferments beside sauerkraut and pickles! I'm a newbie, but looking forward to trying it. I just followed you on Facebook – I thought I already had, but apparently not. Whoops. I started fermenting this year – cucumbers and kraut were the first ones, but I have beets, radishes, and carrots on the go now. The pickles wound up a little funny, but I'm looking forward to giving it another try. Hi, I just liked you on FB. I have no fermentation skills, but would love to learn more and give it a try.Hi, I just liked you on FB. I have no fermentation skills, but would love to learn more and give it a try. I already follow you on FB. I've made a fermented soda and I make my own yogurt. I want the book because it's my dream to live off grid, and food preservation skills are a must in that kind of a setting. this book is on my Top Five Books To Buy As Soon As Possible list. i've picked up various bits of info on fermenting around the web, and have done a few little experiments already. some even turning out successful! i've currently got a mix of hot and sweet peppers going on my counter and they seem to be doing well so far. I did it ! I liked you on Facebook ! I have no experience at all with fermenting, though I am WILDLY curious about it. Okay, that was lame. But really, I would love to win this book. I've been following along on facebook for awhile. I really NEED this book, I don't know why I've never gotten around to getting it (would you believe our local library didn't have it AND had never heard of lacto-fermentation… sheesh!). I've heard that it explains some of the why behind lacto fermentation so I think that's cool, I'm not much of recipe follower. I've done some cool things in the past that turned out great (apple butter, mango-ginger chutney, kimchi and always ferment our ketchup and mayo) but I've had some pretty epic fails too (most recently slimy, brown sauerkraut and pickled eggs which I figured was probably because the vinegar killed the bacteria). Anyhow, you said to NOT right a thesis, sorry about that. I'd love to pick up the book through you so that I'd have it for this harvest season. Thanks for doing the giveaway, its awesome to see that its caught some attention. Already a follower 🙂 Very interested in fermenting foods. I've had this book on my Amazon wish list since early summer. Once my garden started producing I was going to buy it. Well, the Texas drought has really done a number on the garden, only 3 cucumbers worthy of pickling 🙁 There is always the farmers market though and I'd love to learn how to make my own live culture foods!! I don't do FB, sorry. I keep up with my good friends from earlier years in other ways. Too many stories from friends who 'like' something only to find out that opened them up to being seen by others who liked it, too, etc. Plus, I don't need another reason to waste time on the computer! lol. I've made sauerkraut and pickles by fermentation. The sauerkraut came out great. The pickles were what we'd call full sours, they were TART. lol. Still yummy, though. None of the libraries in our county system carry this book, either. I've asked for it to be considered for purchase, but so far, no go. Rachel Z. – I've got you written down as anon @ 10:34 so I know it's you, but I'm going to delete your second entry so you're not double entered. Thanks! This book sounds intriguing. I would love to learn more about fermentation! Already a friend and just started making pickles this year with my mom. We would love this book!! I like you on FB (Katharine Neill). I am just starting to learn about fermentation. I attended a presentation on preserving food at my library tonight and she raved about this book. I get home and what do you know? You are giving it away! Thanks for the chance to win this intriguing book! I've "liked" you on FB for a bit now and I'm happy I do. You have some great posts that are super informative and helpful. I have zero experience with wild fermentation other than knowing a few people that do it and having tried soda that was made bubbly with wild fermentation. I heard a story on NPR I think about the differences between bubbles from wild fermented sodas and carbonated ones and it said that the WF ones had "soft" bubbles. I love the idea of soft bubbles! And want to make them myself. I already "like" you 🙂 I'm just getting in to fermentation, and learning more about it. I have one batch of yogurt under my belt that was pretty successful, but I'd like to try more, especially pickles and kombucha tea! Would love to have this great guide to help me! Comments are now closed for this drawing – thank you to everyone who entered, and please check back Tuesday Aug 30 when the winner will be announced.